Since teeth implants are embedded into the jawbone structure, the artificial replacement teeth are able to have stable support. What’s especially important is that any dentures and bridges, which are mounted to the new implants, won’t shift around in your mouth — which you’ll appreciate whenever you’re eating and speaking. This more solid footing offers a more natural feel for bridges, dentures, as well as individual crowns placed over implants — than what’s possible from more traditional bridges or dentures. Consider having dental implants, call now. One major qualification for this treatment is having healthy gums and adequate bone structure to support the devices, and the personal commitment to maintaining them in sound healthy condition. A consistent routine of regular dental visits and meticulous oral hygiene are both essential aspects critical to their long-term success. Implants are one of the more costly tooth replacement alternatives, and usually your insurance carrier will typically only cover about 10 percent of the expense. Overall Health is important too. Diabetes, makes the process slightly more difficult, yet can be done once blood sugar is tempered. Smoking cigarettes is a big issue with implants, and can significantly reduce the chances of integration to the body. Please the doctor know if you are a smoker prior to starting treatment. Dental Implants, are an ideal solution to getting long term permanent teeth. Chewing power is restored fully, which is something you may not get with traditional dentures or missing teeth. Implants give you a second chance at a missing tooth, and look and feel like you’re existing teeth. Though there may be a slight amount of discomfort for a few days, the pain has been described as slightly less pain then when a tooth is pulled. Pain is a little more when multiple implant cases but most patients say it was fine. Everyone has seen the advertisements for these everywhere. The procedure is recommended if you are missing all of your teeth. There are a few unadvertised caveats though. If the implants are connected right away, (not recommended), you will be on an all liquid/soft diet for 4-8 months. Just be prepared for this. They have great long term results though. Patients have come in showing me treatment plans from Eon clinics or Clear Choice clinics, and our treatment plans have been 20-30 percent less using the same implants and concepts. Over Dentures are a great procedure at Healthy Smiles of La Grange. Over Dentures are implants used to snap on the upper or lower dentures. The upper denture, requires at least 4 implants due to the density of upper bone. The lower dentures can work with 2 implants, however 4 is obviously more ideal. Come in for a consult. Prices starting at $5,000 for implant supported dentures including the denture. Implant bridges are a great option to replacing long spanning teeth without replacing all the missing teeth. 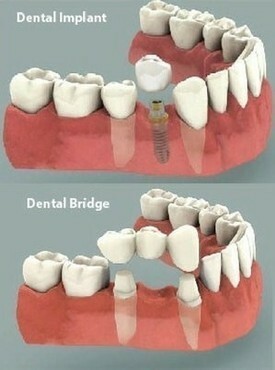 3 unit implant bridges start at $5,000 and are a great option. Come in for a consultation. Never have missing teeth again!